Elizabeth (Minerd) Long Gallentine was born on Dec. 3, 1838 in Hexebarger near Kingwood, Somerset County, PA, the only child of Jacob and Rachel (Ansell) Minerd III. She survived two husbands during her lifetime. Elizabeth grew up in a two-story log house built by her father near the old Bethel Church of God in Hexebarger. The image seen at right is a tintype believed to depict Elizabeth, and was found in an old photograph album once belonging to her son William. In 1859, when she was 21, Elizabeth married 32-year-old George Long Jr. (1827-1872), the son of George and Margaret Long Sr. Their children were James Long, Rachel Ruamy Pritts, Susannah Phalitia "Anna" Kooser and William Jacob Long. Sadly, in 1862, son James died, only a few months old. George as a young man must have had great interest in music, likely in connection with church worship. On Aug. 28, 1853, at age 26, he purchased a copy of The Christian Minstrel, authored by J.B. Aiken. The volume was "a new system of musical notation, with a collection of psalm tunes, anthems, and chants, selected from the most popular works in Europe and America." The book measures 10 inches by six inches, and weighs 1.5 lbs. The heirloom was handed down to four successive generations in the family and today is preserved in the Minerd-Miner-Minor Archives. Records in the Fayette County courthouse in Uniontown, PA show that George and his brother Enoch Long jointly borrowed money in 1863 from George's father in law, Jacob Minerd III. The Long brothers received a loan again in 1864 from Elizabeth's unmarried aunt, Susannah Ansell. Among the items in their household were a cooking stove and pots, copper kettle, iron kettle, wash tub, churn and butter tub, 24-hour clock, silver watch and fallen leaf table. They also had a bed and bedding, chest, three coverlets, dishes, spinning wheel and reel, four chairs, side saddle and bridle, crocks and jars, weaver loom and a cow. Seen here is an old hymnal belonging to Elizabeth and George. It was published in 1855 in Baltimore by the General Synod of the Evangelical Lutheran Church. It is unknown whether the Longs at that time belonged to the Evangelical Lutheran Church, or to the German Reformed Church. In the 1800s, both denominations often worshipped in the same church, at different times, and shared precious resources such as hymnals. On one of the pages, a "Table of Hymns," there is a statement that the hymns are "Translated from the German." The book is so small that it easily fits into the palm of one's hand. Click to see other pages from this rare, precious publication, preserved today in the Minerd-Miner-Minor Archives. Tragedy struck the Longs after 13 years of marriage. 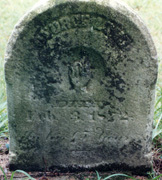 While helping a neighbor build a barn, in the dead of winter, George caught pneumonia, and passed away on Feb. 3, 1872. He was only age 45. His grave marker in the Normalville Cemetery, seen here, was somewhat legible when photographed in August 1992. As a symbol of his Christian faith, a carved finger and hand in the center of the monument point upward, toward the heavens. At Elizabeth's suggestion, her father Jacob was appointed guardian for her three young children -- Rachel, Susanna and William. Jacob served in this role for 30 years, until 1903, by which time the wards had become adults. Daughters Rachel and Susanna made news in 1879 when they helped their school, East Springfield, beat West Overton School in a spelling contest, where they were asked "to spell twenty-two pages in the 'Henderson Test Speller;' one page each day, each pupil to write the words and then correct them, and report the number missed." In 1886, Elizabeth bought outright her father's farm near Normalville. She resided there for many years. The home later was purchased by her son in law, John B. Pritts, where he and wife Rachel raised a large family. At the age of 60, on Oct. 5, 1899, Elizabeth married her longtime neighbor, friend and widower, 67-year-old James M. Gallentine (1831-1908). He was a native of nearby Indian Head, Fayette County, and the son of Abraham (or "Abram") and Elizabeth (Lamp) Gallentine. Rev. T.F. Pershing performed the nuptials in the county seat of Uniontown. 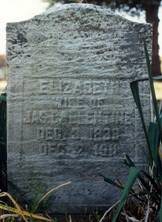 James' first wife, Rebecca (Miller) Gallentine, had died on June 21, 1898, at the age of 65, of kidney disease. Thus James brought five adult children to his marriage to Elizabeth -- William Gallentine, Fanny Kooser, Thomas Gallentine, George Gallentine and Elmer Gallentine. Heartache struck yet again in 1903 when Elizabeth's teenage grandson Hammond Kooser died in Wellsville, OH. The Gallentines enjoyed nine years of marriage, Sadly, suffering from kidney disease which resulted in a "uraemic coma," James passed away on May 14, 1908, at the age of 76. He was laid to rest in the Normalville Cemetery. His son William was the informant for the official Pennsylvania certificate of death. Of the physical assets in the estate, Elizabeth chose to retain two hogs, a cooking stove and tea kettle, a butter churn, one rocking chair and lamp, a windmill, and one sheep and four lambs. In total, these assets were valued at $44.00. At death, James owed debts totaling more than $1,800, including IOUs to his son George, daughter Fanny and her husband Frank Kooser, and son Elmer. There was a controversy over one of the promissory notes, where it appears one of James' sons (George) had forged the very large amount of $643 as a debt owed him. Both widow Elizabeth and her son William J. Long testified in court, with Elizabeth stating that he had seen George give James $50 in cash, with James then commenting, "I owe George $150." George testified that he on behalf of his father, he had bought sheep, paid for physician's bills, bought a cooking stove, and sold a share of the family farm. Daughter Fanny also brought suit against the estate for nursing her mother in sickness in the late 1890s. On Dec. 3, 1910, Elizabeth celebrated her 73rd birthday, having recently moved into the home of her son William Long in Connellsville. She received a "Happy Birthday" greeting card from her young granddaughter, Mary Kooser, who was living at the time in East Liverpool, Columbiana County, OH. The following year, for Elizabeth's birthday, daughter Susan Kooser, now residing in Columbus, Franklin County, OH, sent a card depicting a scene on Columbus's West High Street, with a brief note: "Mother, I am right on this street now." Daughter Susan sent a postal card in late August 1911, from East Liverpool, to where she must have returned after a short stay in Columbus. She wrote: "Forgive me for being so slow answering. I had broke my glasses and can't see to write at all without them. Will write you a letter in a few days. We are all well. Hope you are all the same." In her final years, Elizabeth was an invalid. In mid-November 1911, she was stricken with typhoid fever and then suffered cardiac arrest. On Dec. 2, 1911, the day before her 74th birthday, Elizabeth died in the home of her daughter Rachel Pritts in Normalville. Her obituary was published in the Daily Courier, which said she was an "aged resident of Springfield Township." She was laid to rest beside her husbands at Normalville Cemetery. In August 2014, Elizabeth and George were mentioned in the article "Shapes of the Past: The History of Shape Note Singing in Southern Somerset County, PA," authored by Linda Marker and Duane Howard in the Laurel Messenger newsletter of the Historical and Genealogical Society of Somerset County. The article mentioned their copy of the Christian Minstrel hymnbook and said that the shape note hymnals were "a vital piece of our social history" and that in some instances, "young people would often come six or eight miles to attend a singing." Another rare copy of the Minstrel has been found at the Old Pike Toll House in Addison, PA, from the family of John and Lucinda (Miller) Tressler. Stepson Elmer Gallentine ( ? - ? ) traveled to Kansas in March 1886 and permanently settled there in about 1892. "Since then he has prospered and is now the owner of 900 acres of fine land in Decatur county," said the Daily Courier. "He has been engaged in farming and the raising of cattle and horses. In recent years practically all Gallentine's time has been devoted to stock raising. At present he is dealing almost entirely in the horse business." He returned to Connellsville in July 1911 "with a car load of fine driving and draft horses which he will sell at the stables of Col. J.J. Barnhart at Sunnyside, Dunbar township...."
Stepdaughter Fannie Gallentine (1868- ? ) was born in about 1868. She married farmer Frank Kooser (1871- ? ), son of Elijah and Julia Kooser of Springfield Township, Fayette County. The nuptials were performed by Rev. Ellis B. Burgess at Connellsville on March 13, 1899. Fannie was age 31, and Frank 28, at the time. Stepson Thomas H. Gallentine (1861- ? ) was born in about 1861. On Dec. 22, 1887, just three days before Christmas, Thomas at age 26 married 20-year-old Hattie Miller, daughter of J.H. and Mary F. Miller of Springfield Township, Fayette County. Rev. S.M. Bell officiated at the wedding, held at Greensburg, Westmoreland County, PA.
At the time of marriage, he worked as a stock raiser.